Today, the carbon dioxide emitted from the flue-gas stacks of coal-burning power plants is measured to control the emissions of the pollutants sulfur dioxide, nitrogen oxides (nitric oxide, nitrogen dioxide), and mercury. However, present-day carbon dioxide emission measurements may have uncertainties in the range 5% to 10%. NIST is conducting research to reduce the uncertainties to 1% or 2%. These lower uncertainties will be needed if the US Environmental Protection Agency (EPA) puts a price on carbon dioxide emissions, for example by a carbon tax or by cap-and-trade regulations. 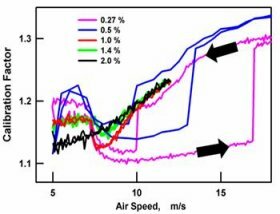 Calibration factor of a multi-hole Pitot tube as a function of air speed at turbulence intensities of 0.27% to 2.0%. (pitch = 20°; yaw = 0°) The arrows show that, at low turbulence, the calibration factor is smaller with increasing air speed than with decreasing air speed. Carbon dioxide emissions are determined by mapping the flow in stacks using 1-, 2- and 3-dimensional differential pressure devices, such as standard Pitot static tubes, S-probes and multi-hole Pitot tubes. NIST has outfitted its low-turbulence wind tunnel with an automated stage to calibrate such differential pressure devices as a function of air-speed, pitch angle, and yaw angle. During preliminary measurements, Crowley, et al. discovered that the calibration can show hysteresis that gradually disappears as the turbulence in the flow increases. Thus calibrations must account for the turbulence in the flow to achieve the target accuracies of 1% or 2%. 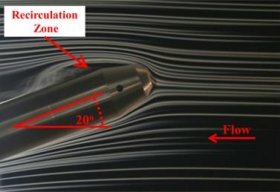 The recirculation zone near a multi-hole Pitot tube is associated with the hysteresis in the calibration factor of the Pitot tube. In addition to improving the calibration of differential pressure devices, NIST is developing a scale-model smoke stack test-bed to study calibration protocols. NIST is also studying unconventional techniques for measuring carbon dioxide emissions such as a long-wavelength acoustic flow-meter.